THE YOUNG BUCS continue to take the stage and entertain people who have come to expect their favorite oldies done in The Young Bucs style, in dance venues and concerts! Whether it’s Gene Chandler’s “Duke of Earl” or “Little Darlin”, made famous by The Diamonds, THE YOUNG BUCS Doo-Wop division take you back to the ‘50’s, and the days before IPods and cell phones; back to a time when you wore a “DA” or maybe “Pedal Pushers”. But having been a teen during that era is not a prerequisite to enjoying this music. 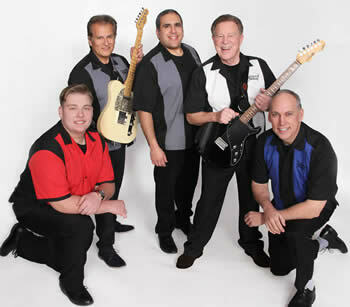 The style and themes of the music from the doo-wop era are classic and timeless. Audiences of all ages continue to be entertained as The Young Bucs bring it to life. Doo-Wop and Rock-n-Roll are unique and treasured American art forms and a rich part of ourheritage. Elvis Presley, Dion, The Platters,Chuck Berry, The Diamonds and many, many more individuals and groups define that era. While The Bucs do have members with backgrounds in other syles, including Bluegrass, jazz, 80's rock, folk, blues, musical theater and rock and roll, collectively they bring it all tgether to recreate the sounds that resonate from the 50's-60's. Vocal harmony is the core of both Young Buc styles and is the passion that drives song selection and arrangements. 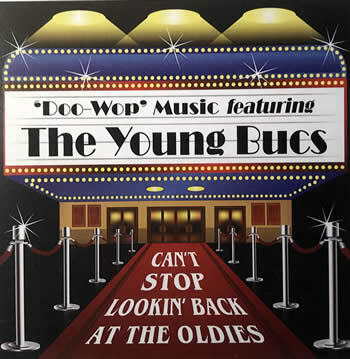 YOUNG BUCS RELEASE 3RD DOO-WOP CD!!!! 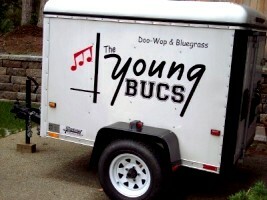 After the release of their first Doo-Wop Album in 2009, The Young Bucs returned to the studio in 2014 to record 16 MORE oldie favorites. And now.....The Bucs have released their THIRD collection of Doo-Wop favorites! "CAN'T STOP LOOKIN' BACK at the OLDIES" ....... You will want to get your copy at The Mill Casino Gift Shop (KoKwell Gifts) or at the Coos History Museum. OR..... if you wish to check us out and download a digital version, click the "Recordings" tab, above, for links to iTunes or CD Baby. You may purchase the actual CD album or the digital version on CD Baby. You can listen to 30 second samples of all 16 songs, purchase them individually for .99 each or $14.99 for the whole album! AMAZING!